We will get back to shortly. Thank you! The Collagen Bar is all about restoring your collagen level back to where it is optimal. We at the Collagen Bar focus on delivering collagen to where it is needed to rejuvenate the skin and body. Our patented Collagenizer treatments feature our unique formulas (part of nature’s most potent anti-aging ingredients) and couple of the most advanced, FDA approved non-invasive technologies. Diana Seo is the owner, founder and primary aesthetician behind this exclusive new skin lab concept located in Manhattan, and Greenwich, CT.
At The Collagen Bar, we deliver skin results. Our approach is unique because of our restorative ingredients curated by nature, breakthrough technology harnessed by science & our custom non-invasive techniques. The clients will not only feel revived and invigorated, they will instantly notice a reduction in lines and wrinkles, a refined skin elasticity, re-sculpted tissue lift and a noticeably youthful appearance! The COLLAGENIZER® features the proprietary technology of Dermoelectroporation which uses the skin’s water based intercellular channels to promote Transdermal Delivery. 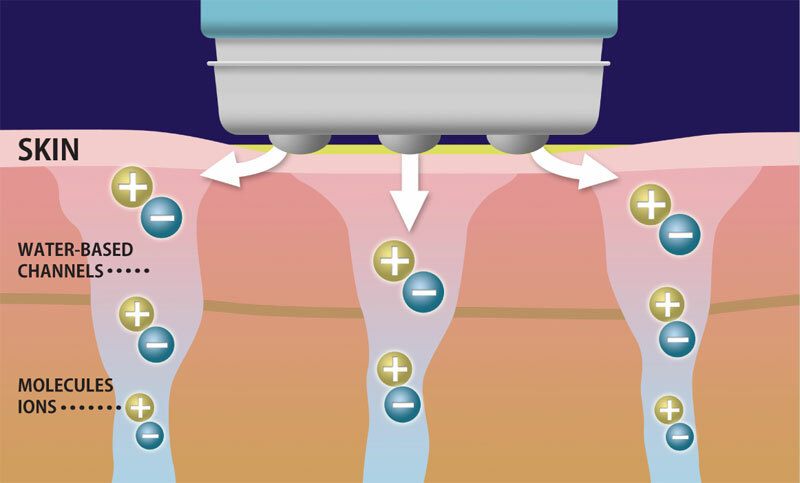 The machine is unique and substantially different from electrophoresis, microcurrent and galvanic devices because of the continuous, very low reversed polarity current. The COLLAGENIZER® delivers non-invasive, instant and long lasting effects. Moreover, macromolecules like collagen can be delivered for the "first time! Forma™ technology is the superior choice for the treatment of wrinkles. Forma stimulates the formation of new collagen and improves the skin’s elasticity for long-lasting and remarkable results. The radio frequency current flows between the electrodes to provide a comfortable thermal experience, without concerns of hot spots or undertreatment. Built-in temperature controls allow for the attainment of clinically proven optimal epidermal temperatures. In addition, Forma has the exclusive capacity for prolonged exposure at therapeutic temperatures, which can be reached quickly and uniformly. BodyFX™ treatments target problematic fatty tissues for ideal body contouring. Radio-Frequency provides precise and optimal heating of the skin for reduction, contraction and body shaping. Clinical studies with histologies showing volume reduction and contraction. Having graduated with a Biophysics degree from the University of CT, Diana's involvement with the sciences only enhanced her experience and knowledge in the skincare, beauty and health industries. She has had over ten years of combined experience in the health, medical, fashion and beauty fields. In the last six years, she has learned a great deal working for one of the most notable plastic surgeons in the world, Dr. Charles Thorne, who wrote a textbook on plastic surgery named "Grabb and Smith's Plastic Surgery." Continuing her education, Diana then graduated with advanced training at Atelier Esthétique Institute of Esthetics. Besides her aesthetician license, she received the ITEC (International Therapy Examination Council) certification, part of the new standard in aesthetics. The ITEC certification includes both the Beauty Skin Specialist and Facial Electrical diplomas, which is recognized over thirty-nine countries. Her strategy to skincare combines both Eastern and Western teachings. She contributes her holistic approach to her interests, which includes Ayurveda, yoga, acupressure and reflexology. She firmly practices and preaches that balance is key to a healthy life. She believes that "Your body systems work together, therefore, they are interdependent of each other. Visible signs of aging are inevitable, but can be slowed dramatically with proper care." Dr. Edward Jacobson is a Board certified gynecologist who has been in private practice for over thirty years in Manhattan and Greenwich, Connecticut. He trained at the New York Hospital-Cornell University Medical Center where he remained an attending physician until moving his practice of vaginal surgery to Greenwich 30 years ago. He is a Fellow of the American College of Obstetricians and Gynecologists, a Fellow of the American Association of Gynecologic Laparoscopists, and is a member of the Bioidentical Hormone Society, the International Hormone Society, the Bioidentical Hormone Initiative and the American Academy of Cosmetic Gynecologists. He is one of only a few gynecologists in the United States with advanced training and extensive experience with both laser and radiosurgery. In addition, Dr. Jacobson’s office practice stresses natural and alternative options for relief of gynecologic symptoms. He is an expert in the use of the management of natural hormone supplementation for symptom relief and long term preventative health care. Dr. Jacobson periodically consults with patients and sees patients at his office in Beverly Hills, California. He is on the attending medical staff at Greenwich Hospital and Stamford Hospital in Connecticut. Dr. Jacobson has appeared in numerous television and radio shows and has been interviewed by the New York Times, the London Times and Fox News.